Colin Singleton has dated nineteen girls named Katherine, and has been dumped by all nineteen. After being dumped by his nineteenth Katherine, he decides to go on a road trip to nowhere with his best friend, in hopes of getting over her. What he ends up doing is coming up with a mathematical formula that will predict the future of all relationships. I have to say, this is definitely my least favorite of all John Green’s books. It was actually kind of hard for me to get through this one, mainly because I disliked the main character so much. Colin is a child prodigy, and because of this he acts extremely pretentious towards other people. For example, when he first meets Lindsey Lee Wells, a perfectly nice Southern girl in a small town, he automatically assumes that she is dumb and that he won’t like her just because she’s reading a celebrity gossip magazine. She ends up proving him wrong, but it is horrible that he immediately judges her for that. Colin is also extremely self absorbed. He constantly is moaning and groaning about his Katherine issue, but never really cares about what everyone else is dealing with. His best friend Hassan is dealing with having to move on with his life and go to college, but Colin is too focus on his Katherine problems to really care. He even kind of pushes Lindsey’s problems aside when she opens up to him, but I will say that towards the end of the novel he began to realize how self absorbed he was being and toned it down a bit. A big problem I had with this book is that it was extremely predictable. Most of John Green’s books have some sort of twist or shocking event or something that wows you. I felt like I knew exactly how this book would end the moment Colin and Hassan arrived in Gutshot and met Lindsey. This made the ending very anticlimactic and predictable to me. 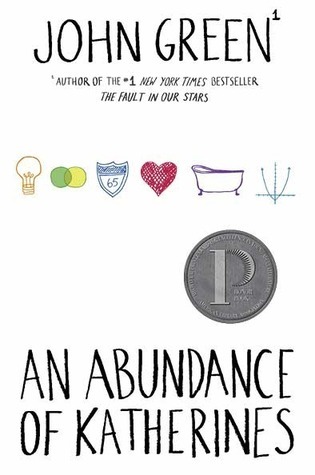 Overall, An Abundance of Katherines is a cute story, but is definitely not one of my favorite John Green novels. I did love the footnotes and the math geek in me loved the mathematical formulas, but the main character and the predictability of the story made it a slight disappointment. An Abundance of Katherines was released on September 21, 2006.